Researchers from Cambridge have at last solved one of the mysteries of the animal world, Inside Out has revealed. 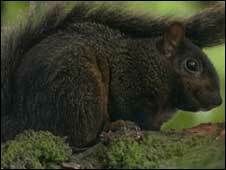 Black squirrel numbers are rapidly increasing and until now the UK origins of the creatures have been unknown. The black squirrel was first spotted in the UK 90 years ago in Hitchin, Hertfordshire. But it now accounts for almost half of all squirrels in some areas around Cambridgeshire and there are an estimated 25,000 in eastern England. While the black squirrels have been around for a number of years no-one has been able to explain where they came from. Inside Out has been given exclusive access as scientists reveal for the first time how the black squirrel came into being. Some 10,000 years ago, the red squirrel had Britain to itself but in 1892 a pair of American grey squirrels were released into the wild. The result is that today there are more than two million grey squirrels and just a few hundred reds living in a handful of places - and now the black squirrel represents the same kind of threat to the grey as the impact of the grey on the red. Helen McRobie and Alison Thomas, from Anglia Ruskin University in Cambridge, are spearheading the black squirrel research and could not agree about how the black squirrel population in the UK came into being. Ms McRobie believed the black squirrel was the result of a genetic mutation, two grey squirrels mated and produced a black off-spring which grew up and mated. Its off-spring were even darker and this continued until black became the over-riding colour. Ms Thomas disagrees, saying: "I don't think the black squirrels we have here in the UK are the result of a genetic mutation. "That would require too big a jump; I just don't think that's plausible at all. Such a big change just doesn't happen like that in nature." They finally came up with a solution to answer the question of how the black squirrel came into being, by importing a black squirrel from the USA. Genetic markers were taken and compared with a British black and the result was proof that the squirrels are descendents of American blacks that escaped from zoos. It seems possible now that the grey squirrel has had its day and that black squirrels could become the dominant species across the UK. The BBC Inside Out programme screens on BBC1 in the East at 1930 BST on Wednesday, 21 January.